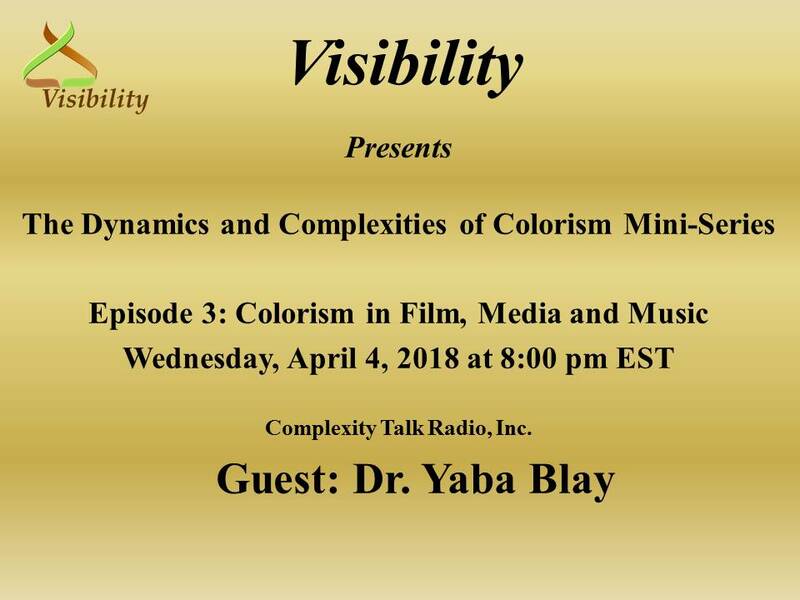 Colorism in Film, Music and Media – Complexity Talk Radio, Inc.
Join Dr. Culbreth and Dr. Yaba Blay, “one of today’s leading voices on colorism and global skin color politics for a discussion on colorism in film, media and the music industry. Topics include why colorism is still an issue in the millennium, colorism in the film, media and music industries and how colorism is an issue in each industry, the movie Black Panther, how colorism affects Black women in the film, media and music industries, the psychological, emotional, physical and social traumas of colorism on Black women as “audiences” and actresses, performers, etc. among other topics. Dr. Yaba Blay is a professor, producer, and #ProfessionalBlackGirl. As a researcher and ethnographer, she uses personal and social narratives to disrupt fundamental assumptions about cultures and identities. As a cultural worker and producer, she uses images to inform consciousness, incite dialogue, and inspire others to action. While her broader research interests are related to Africana cultural aesthetics and aesthetic practices, and global Black popular culture, Dr. Blay’s specific research interests lie within global Black identities and the politics of embodiment, with particular attention given to hair and skin color politics. Her 2007 dissertation, Yellow Fever: Skin Bleaching and the Politics of Skin Color in Ghana, relies upon African-centered and African feminist methodologies to investigate the social practice of skin bleaching in Ghana; and her ethnographic case study of skin color and identity in New Orleans entitled “Pretty Color and Good Hair” is featured as a chapter in the anthology Blackberries and Redbones: Critical Articulations of Black Hair/Body Politics in Africana Communities. Named to The Root 100 (2014), an annual list of top Black influencers, Dr. Blay is one of today’s leading voices on colorism and global skin color politics. Her commentary has been featured on CNN, BET, MSNBC, NPR, O Magazine, Ebony Magazine, The Philadelphia Inquirer, The Root, Huffington Post Live, Colorlines, Al Jazeera America and elsewhere. A Black beauty scholar-activist, Dr. Blay is the creator of the LOCS of LOVE care package, the #PrettyPeriod movement, and the #PrettyLipsPeriod social media campaign.